Heavy zippers, squished insulation, no wriggle room - who needs it? I've finished my sleeping quilt for my first long hike. Even my wife was impressed at how nicely it turned out! From my point of view, it was very easy - so easy I'm making another one. Sleeping quilts are making steady headway against sleeping bags, especially for long treks where light loads are desired. Actually, a lighter load is always a benefit no matter how long your trek is, but carrying a 4 pound bag for two days doesn't wear you down as badly as lugging it around for two weeks. A quilt works by laying over the top of the backpacker and being tucked in on the sides as desired. Laying on a pad gives underneath insulation, just like when using a sleeping bag. There is a foot box area which keeps the quilt on and tucked in below. More Efficient - the insulation you lay on gets squished and loses its loft. That means it doesn't insulate. It's really just extra weight and expense. Flexible - the quilt can be wrapped around snugly or loosened up. It can be completely thrown off or lain on during warm nights. I can move my legs and body around without feeling quite so like a caterpiller. Customized - any MYOG (make your own gear) item can be made specifically to your size or needs. I made this quilt longer than normal and left off a part I didn't want. I learned a lot from making this quilt. I made it wider than I really need which means about 7 square feet of unnecessary fabric and insulation, which equals extra weight. My next one will be slimmed down. 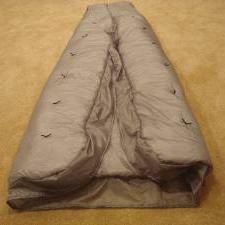 It has about 2 inches of loft on top - that's a lot, just measure your own sleeping bag's thickness. My next one will have just about 1 inch for my summer trips with warmer nights. It's very easy to make a quilt, and it doesn't need to be perfect. As long as you make sure the stitches are hitting all the layers of fabric, it turns out just fine. I'll easily stay warm below freezing with this quilt. I'll try it on my back porch if we ever get some more cold weather, but I'd bet it will do just fine down to around 20 degrees and then I'd need to put on extra clothes. It weighs 2.5 pounds which I feel is fine for the range of temps I can use it in. The fabric is 1.1oz silnylon and the insulation is continuous filament polyester - goose down would be lighter, but messy working, more expensive, and susceptible to moisture. I expect my second quilt to be good to around 40 degrees and weigh closer to 1 pound - but we'll see.